James Wade is introduced as the Chicago Sky’s new coach and general manager. Photo courtesy of Chicago Sky. 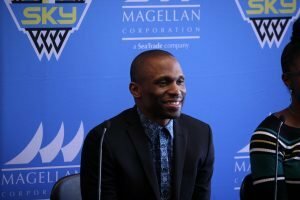 The Chicago Sky introduced James Wade as the new head coach and general manager of the franchise in a press conference Tuesday. Wade, 43, replaces Amber Stocks, who was let go in September after her second season. In 2018, the Sky was the league’s worst defending team, giving up 90.1 points per game. They lead in turnovers, averaging 15.3 per game. A Kennesaw State graduate, Wade played professionally all over Europe for 12 seasons before entering the coaching ranks. He spent four years as an assistant coach with the San Antonio Silver Stars under Dan Hughes, was was assistant coach for Cheryl Reeve and the Minnesota Lynx for the last two seasons. The franchise ownership sought input from players when conducting their coaching search. Chicago boasts a talented roster of former All-Stars in Allie Quigley, Courtney Vandersloot and Stefanie Dolson, and they have four top-five draft picks: Diamond DeShields, Gabby Williams, Cheyenne Parker and Alaina Coates. The team has an ideal mix of youth and veteran leadership to make noise in the league next summer. One of Wade’s tasks will be to put those pieces together. What attracted you to the position of head coach and general manager of the Chicago Sky? You look at the roster we have and the ownership, I think it’s a great opportunity. We have the potential to have a young booming roster with numerous core players and numerous play-makers. I felt like the team had a lot of untapped potential and I just wanted to be a part of it. Have you begun to assemble a coaching staff? I’m interviewing coaches right now as we speak. Within the last two to two and a half weeks I’ve been interviewing coaches consistently. We’ll keep on going, but I’ve got it down to a few candidates that I really like. It’s about finding the perfect fit. Hopefully we’ll have something done pretty soon. What style of play will you bring to the Sky? We’re going to move the ball a lot. I want my play-makers making plays. We’re going to build on the fact that we are a team that’s willing to pass the ball. They led the league in assists last year, but now we have to cut out the turnovers. I want to play fast, I want to move the ball, and I want to play inside-out. Your team has a lot of free agents with only about five players under contract. What are you looking for to add to the team this off-season? We have to secure our core. They had a great core last year. We want to secure them going forward and then maybe find a role player or two that can help balance us out. 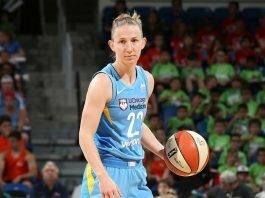 So, is re-signing Courtney Vandersloot and Allie Quigley the top priority? I don’t want to say any names because I don’t know if I can, but re-signing those players is a top priority. Cheyenne Parker had a break out season but seemed to be mis-used under the last coaching staff. How does she fit into things going forward? She’s that one post player that likes to duck in, she wants the ball on the block, and she’s aggressive. I like Cheyenne – I’ve always like Cheyenne. I think she will be an important piece going forward. You have the fourth pick in the upcoming draft. Will you choose the best player available, or will you draft by need? It depends. Best player available is typically where you go with 1-through-4. It can be a balancing act, too, because if you choose by need but that player is a ninth pick talent, you don’t need that player [laughs]. I think you have to take the best player available. Have you spoken to coach Reeve and coach Hughes about your new venture? All the time. They actually helped me throughout the process. I lean on Dan and Cheryl for a lot of advice. They’ve always been there for me and I suspect that they always will. What did you learn from them that you’re going to implement as a head coach? It’s going to be a lot of non-negotiables. I’m going to put the players in a position to succeed and try to play to their strengths. I think it’s about the players and making sure that they’re in a good place, mentally and physically. I know that it’s not about me. If I can get the team going the way they’re going but doing it together and playing to their strengths, I think it will be good. Last season this team gave up the most points in the league and averaged the most turnovers per game. How will you go about fixing those issues? I think a lot of the turnover issues were due to the backup point guard situation. It was tough. You had Jamierra [Faulkner] go down and you depended a lot on Linnae [Harper] who was young and just out of college. It was her first year in the league. That was a tough situation to be in, especially when a seasoned veteran gets injured. We’ll find ways to combat that. We’ll be fine. What do you hope to achieve in your first season in Chicago? What will you achieve [laughs]? We’re going to be a competitive team. I want to go as deep as we can in the playoffs. That’s the reason I’m here. We’re not rebuilding. We’re trying to put together a team and we want to go on a deep run.